violin and electronics, performed by Emily Westell The title, Sun Propeller, refers to the propeller-like rays of light that occur when sunbeams pierce through openings in the clouds. 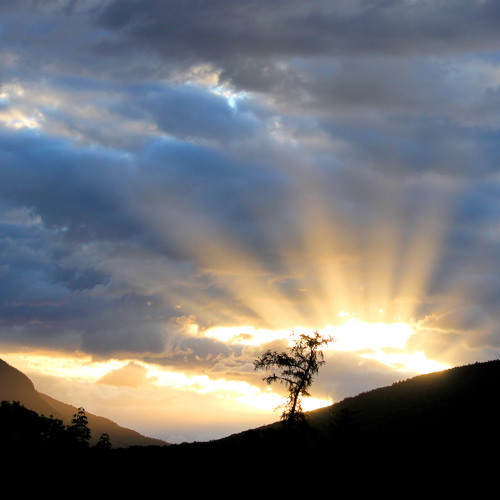 Scientifically, these columns of light that radiate from a single point in the sky are known as crepuscular rays. The actual phrase "sun propeller" is a literal translation of the Tuvan word for these sunbeams: Huun-Huur-Tu (also the name of a famous Tuvan folk singing group). The ideas for this work came while I was researching the music of Tuva, a culture in southern Siberia. Their music, particularly the practice of throat sining, is a vocal imitation of natural surroundings (the sounds of babbling brooks, wind resonating against mountains, etc.) and is used to pay respects to the spirits of nature. This type of Tuvan music is built upon a low drone-tone with overtones floating above. The music values timbre and vertical intervals over traditional western melodic and harmonic principles. While Sun Propeller does not attempt to imitate Tuvan music in anyway, it borrows the concept of the static drone and timbre preference in the language used to write the violin part and electronics. The violin is scordatura (D-D-A-D), with the low G string being tuned down a fourth to D and the high E string down a second to D. The electronics, live processing and pre-recorded sounds, are diffused through four speakers.